This 11-cup model gets lots of use in my kitchen. 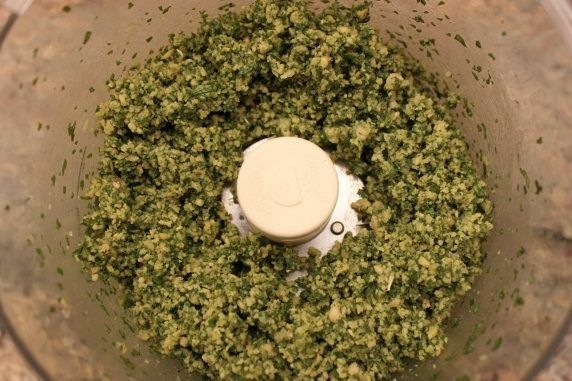 It makes so many tasks easier--like making pesto in a snap! These hold 1/2 cup of pesto--just the right amount for pizza sauce and many other recipes. I keep olive oil in one of these bottles for squeezing it in a pan when I saute or topping off the pesto "ice cubes" to prevent browning. Pesto has many uses. 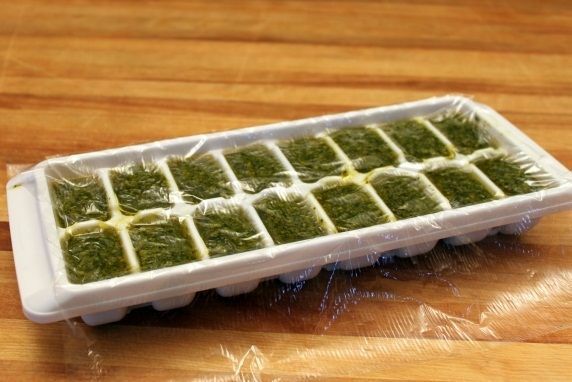 It is easy to make and freeze to have ready to enhance foods for breakfast, lunch, or dinner. 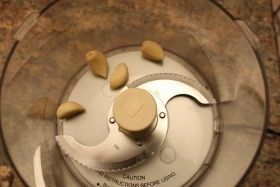 In a food processor, finely chop the garlic. Add basil leaves and chop until fine. 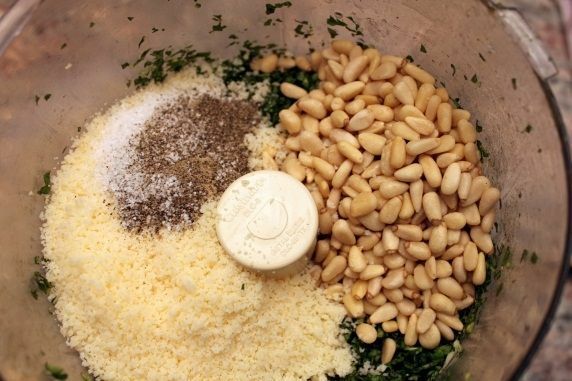 Add cheese, pine nuts, salt, and pepper; pulse until the consistency of a coarse paste. 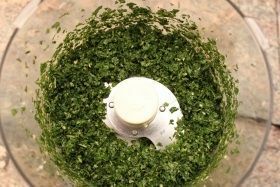 With the food processor running, slowly pour olive oil through the feed tube and continue mixing until the oil is completely combined with paste. Store in airtight container in refrigerator for up to one week. Pesto freezes well. 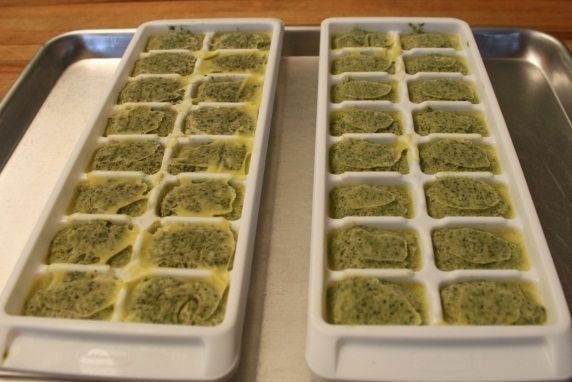 Freeze in ice cube trays, and then store frozen pesto cubes in plastic freezer bags in freezer for up to 6 months. 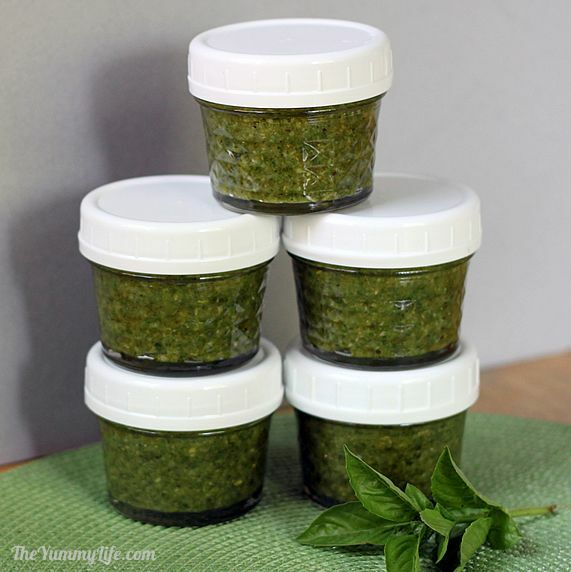 Pesto may also be frozen in small jars or plastic containers for up to 9-12 months. Well, Bubba, that's the way I feel about pesto. 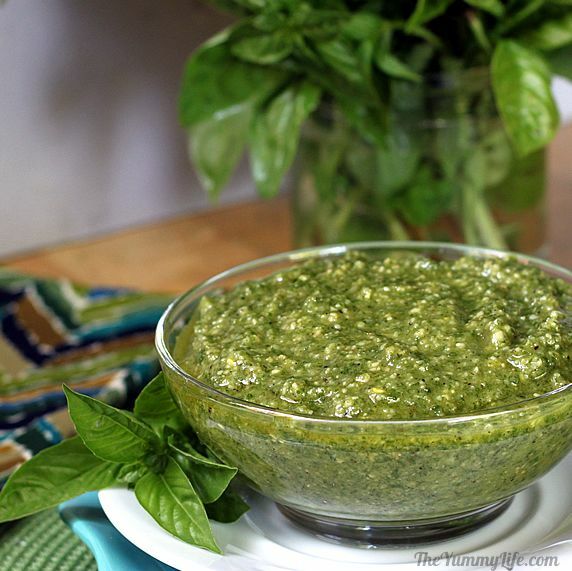 you can make pesto salad dressing. And, that's not even close to "about it". There is so much more you can do with pesto. Not only is pesto as versatile as Bubba's shrimp, but it is so delicious and easy to make. The main ingredient, basil, is in abundant supply this time of year. 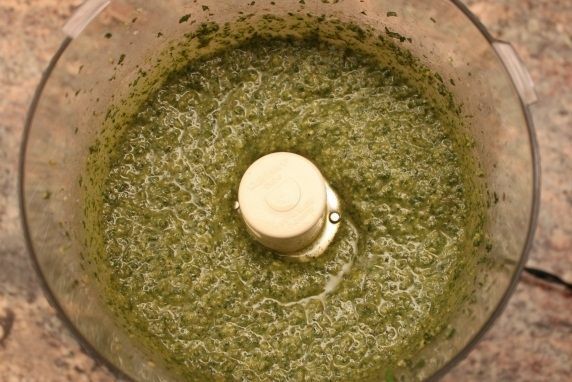 So, I seize the opportunity to make up a few batches of pesto and freeze it so I'll have homemade pesto throughout the fall and winter. Once frozen, it may not be quite as good as fresh, but it's darn close and way better than the stuff in jars at the grocery store. 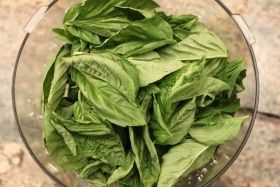 Fortunately, fresh basil is available in grocery stores year round in most places; so if you miss out on freezing basil in the summer, it is always possible to find the ingredients to whip up a fresh batch pretty much any ol' time. Did you know? Basil is high in antioxidants and is considered one of the most nutritious herbs. It is rich in vitamin A and C and contains potassium, magnesium, iron. Step 1. 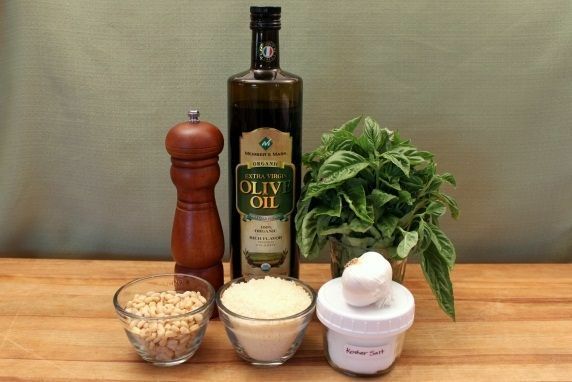 Assemble the ingredients: fresh basil, olive oil, black pepper, kosher salt, garlic, Parmesan cheese, pine nuts. Step 2. 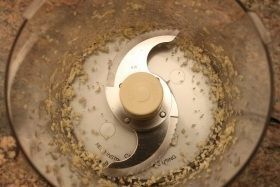 Chop the cloves of garlic in the food processor. Keep it whirling until no garlic is flying around in there any more. Step 3. Add the basil leaves. Give them a whirl until they are finely chopped. Step 5. Pulse until it forms a coarse paste. Step 6. With the machine running, slowly pour in the olive oil through the feed tube. Keep it running just until everything is well mixed. That's it! Easy, huh? You can put the pesto into an air tight container where it will keep in the fridge for up to a week. 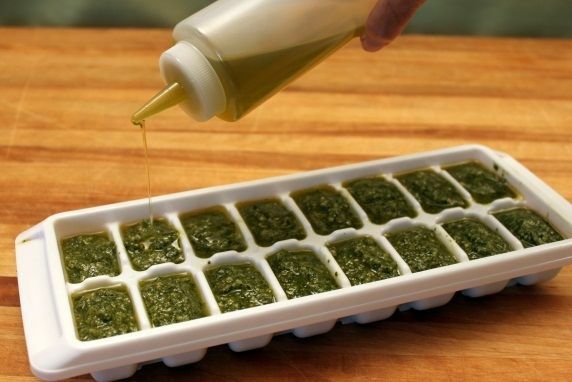 If you're planning on freezing some or all of the pesto you make, you'll need an ice cube tray or two. I also like to have some olive oil in a condiment squeeze bottle for drizzling out small amounts, but you can also pour from the original olive oil bottle or use a spoon. It's helpful to know how much each of the ice cube compartments holds, so that you can easily remove the needed amount from the freezer later on. 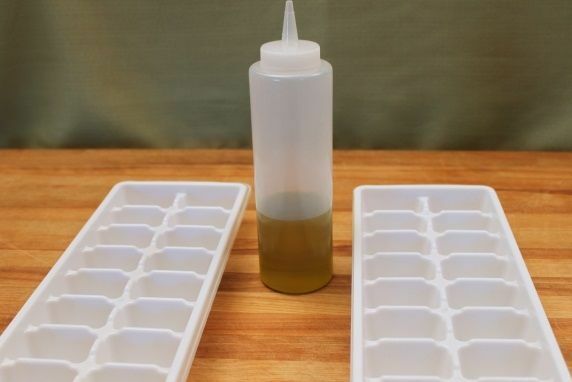 To figure this out, use a measuring spoon and add water to one of the ice cube compartments in your trays to determine how much each cube and tray will hold. My ice cube compartments each holds approx. 2 tablespoons. 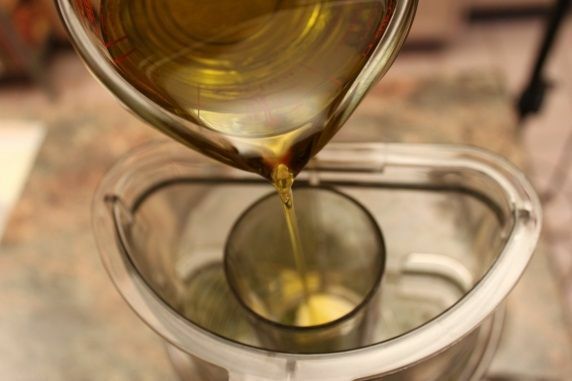 Use a squeeze bottle or spoon to drizzle a light layer of olive oil over the top of each cube compartment. This will keep the pesto from getting dark from contact with the air. 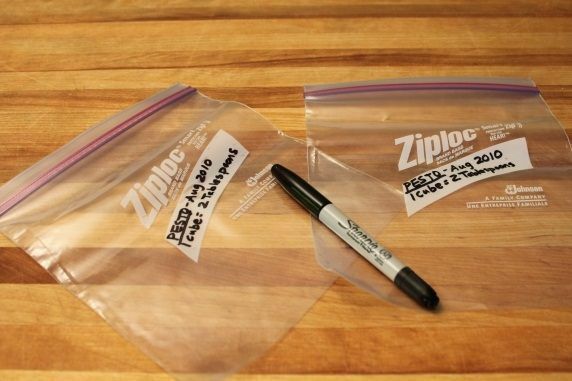 Label quart size plastic freezer bags. I like to put the quantity of each pesto cube on the label (1 cube = 2 tablespoons), in case this old brain of mine forgets that detail when it's time to use the frozen pesto later. I flip the ice cube tray over and put it under the the faucet to trickle some cold water on the bottom of the tray for a few seconds--hold your hand underneath the tray so the cubes don't fall into the sink. 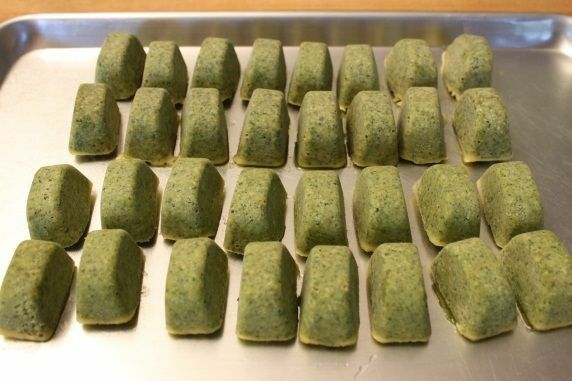 The pesto cubes pop right out. 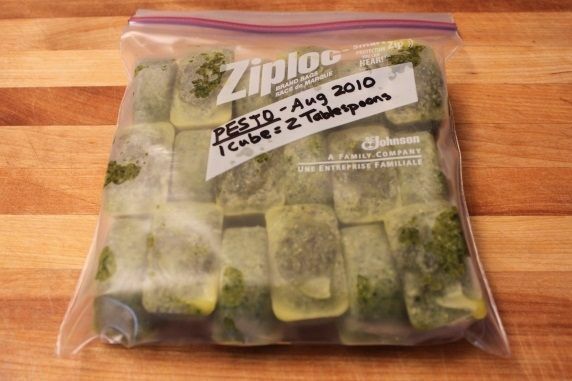 Fill the plastic bag with frozen pesto cubes and return it to the freezer. The are good to use for up to 6 months. 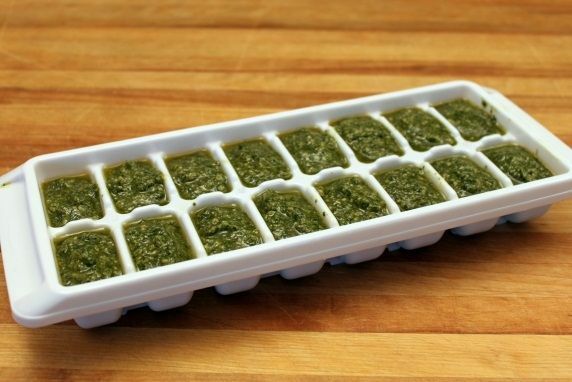 You can also freeze pesto in small jars or plastic containers. I like to freeze most of mine in these 4 oz. mason jars. 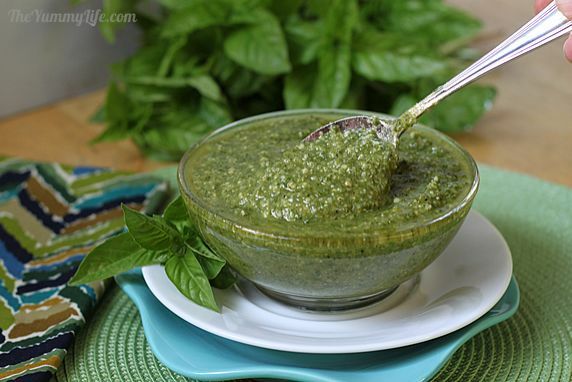 They hold 1/2 cup of pesto--just the right amount to use for pizza sauce and many other recipes. These frozen jars of pesto are good for 9-12 months. The next time you want to add some quick flavor to pasta, or meat, or salad, or ... (see my Bubba list at the top of this post), you've got it in your freezer. Do you have a food that you make with lots of variations? Just wondering what your Bubba food is. 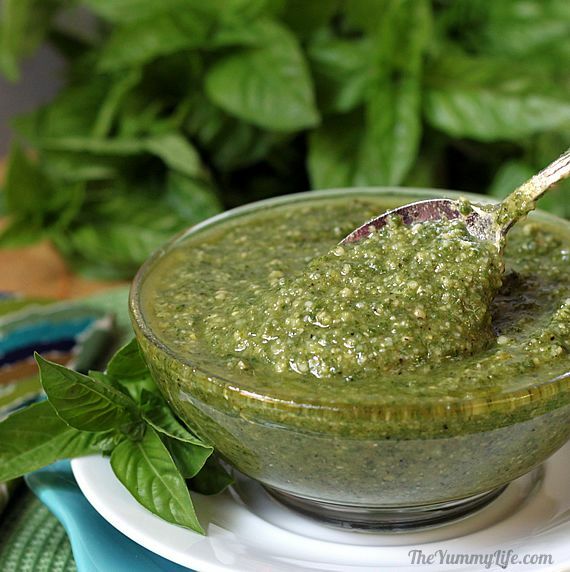 Or, maybe pesto will become your Bubba food. It sure is mine.